A year later, we can expect a very different message in Tuesday’s State of the Union speech. Trump has become a relentless cheerleader for the American economy, touting the low unemployment rate, steady job growth, and record stock market peaks that have occurred during his brief presidency. Wonks will debate how much credit he really deserves, personally, for any of this. (Foreign markets have soared too, and several are also at all-time highs.) But the fact is that his words will resonate today just as his bleak view resonated in 2016, even with many people who ultimately didn’t vote for him. Gallup found in early January that Americans’ confidence in the economy soared 16 points during Trump’s first year in office, reaching positive territory for the first time since Gallup began tracking it in 2008. But this transformation in perceptions is out of step with the underlying reality. The basic truth is that while the economy displayed steady growth over the past 12 months, the same was true of the 72 months or so that came before that. The big change hasn’t been in the economy but in people’s hearts — Republican Party loyalists, in particular, weren’t ready to admit the economy had recovered until they had a co-partisan in the White House. Two polls from Gallup tell the tale. The first, comparing annual averages, shows that Democrats and Republicans have reacted very differently to Trump’s ascent, with Republicans becoming more positive about the economy and Democrats less so. That perceptions of the economy would be mediated by partisanship is perhaps to be expected. But Trump’s key achievement here is that while both Democrats and Republicans have changed their minds about the economy, Republicans have responded more sharply. 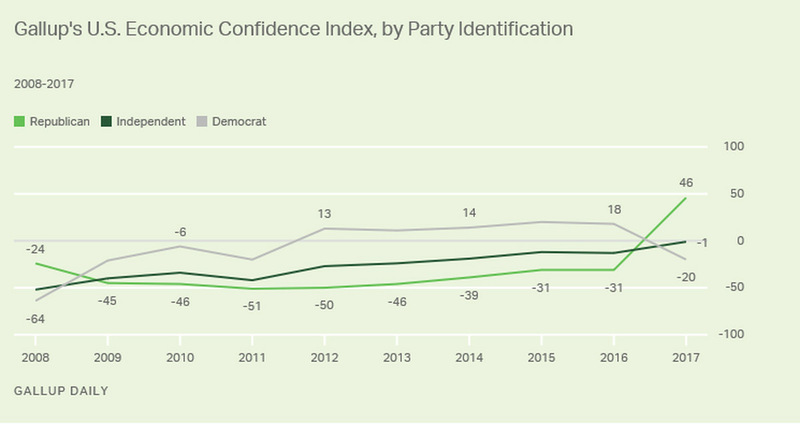 They’ve nearly uniformly developed positive views about the economy due to Trump, while many Democrats also hold positive views about the economy and likely simply give former President Barack Obama the credit for it.